Before you can begin creating a dynamic ad, you’ll need to set up a product catalog and implement a Dot tag on each page of your website. Follow the steps outlined in this section to get started. For starters, you’ll need to create a Dot tag. However, if you have existing Dot tags created outside of Native & Search (for example, DSP) that appear in the UI and wish to use them, you need to import those tags into Native & Search by marking the Verified column in the UI as Yes. A Dot tag enables you to pass the user signal to your campaign. You’ll also need to pass the user funnel information and product id per user event from your website. If you already have a Dot on your website, you simply need to update that Dot with an additional script in order to run a Dynamic Product Ad campaign. 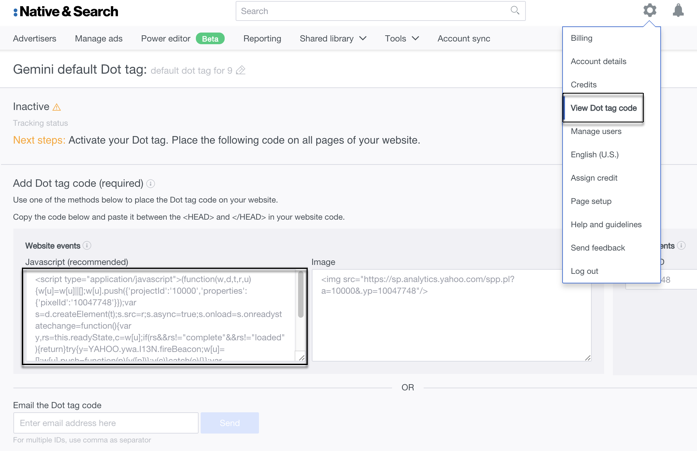 If you already have an account with Google Tag Manager and are familiar the Google Tag Manager UI, you may want to take advantage of this tag manager to set up your Native & Search Dot tags for NFA. The steps to work with the Google Tag Manager are described in the Google Tag Manager Guide for Native & Search NFA Dot tags. Similarly, if you already have an account with Signal and are familiar the Signal UI, you may want to take advantage of this tag manager to set up your Native & Search Dot tags for DPA. The steps are described in the Signal Tag Manager Guide for Native & Search NFA Dot tags. Also, if you already have an account with Adobe Dynamic Tag Manager and are familiar the Adobe Tag Manager UI, you may want to take advantage of this tag manager to set up your Native & Search Dot tags for NFA. The steps are described in the Adobe Tag Manager Guide for Native & Search NFA Dot tags. Likewise, if you already have an account with Tealium Tag Manager and are familiar the Tealium Tag Manager UI, you may want to take advantage of this tag manager to set up your Native & Search Dot tags for NFA. The steps are described in the Tealium Tag Manager Guide for Native & Search NFA Dot tags. Finally, if you already have an account with Sizmek, you could use this tag manager to set up your Native & Search Dot tags for NFA. Steps are described in the Sizmek VersaTag Container Guide for Native & Search NFA Dot tags. A Dot tag lets you capture events that are related to the products in your catalog. 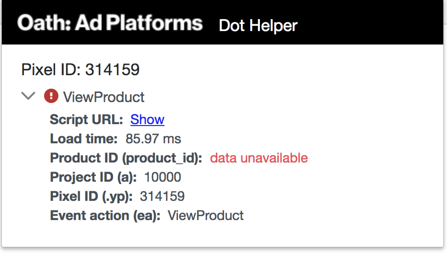 To capture those events and track the product that a user has interacted with on your website, your Dot tag needs to pass two items: a Product id and an ea parameter. The ea parameter is an event action trigger in code that serves to indicate the user funnel for your product catalog, as described in the table below. If the ea parameter is not passed and there is only product_id, the event is assumed to be ViewProduct. product_id product id Used to pass the product id for the retargeting use case. If you’re sending multiple product IDs in the same event, you need to use commas to separate them. In the Native & Search UI, click View Dot tag code from the pulldown menu list. For the next step in your setup, you’ll have apply two scripts – standard and dotq – to all the pages on your website that you’d like to track. Use the entire Dot tag code without modification. As a best practice, copy-and-paste it into whatever page template or content management system you use to tag all your website pages. While you may place the tag anywhere on the webpage, it’s recommended that you paste it in the &lt;head&gt; section. If you only wish to send events for certain pages, you’ll need to place the Dot tag only on those pages. This is often done with the help of a tag management platform, such as Ensighten or Google Tag Manager. You’ll also need to add the dotq script to your web pages in order to pass the user action and the product id. A dotq script looks like the example shown below, with the strings et, ea and product_id specified in the script. You can use this as a template for your own dynamic product ads. projectId You can find this value on your Dot page in your account. pixelId Find this value on your Dot page in your account. ea Represents the user interaction with your product. productId Represents the product ID on your web page. Each page must have a separate product ID representing the product on that page. The et parameter is required to be included and set to the value custom. The values of projectId and pixelId must match those of the same parameters of the Dot tag included on the page. The add to cart value must be in this format: AddToCart. The product Id should match the value 1234 in your product catalog. The value of XXXXXX and YYYYYYY should match your own Dot on the Dot view page. Native & Search now provides you with a Chrome extension that you can use to inspect, validate and troubleshoot Dot tags that you’ve instrumented on your website. Click Oath Ad Platforms Dot Helper. This takes you to the Developer Tools section of the Chrome Web Store where you can add the extension to your Chrome browser. Click the ADD TO CHROME button in the upper right corner to install the extension and add it to your Chrome browser. The Dot Tag Helper has been installed. 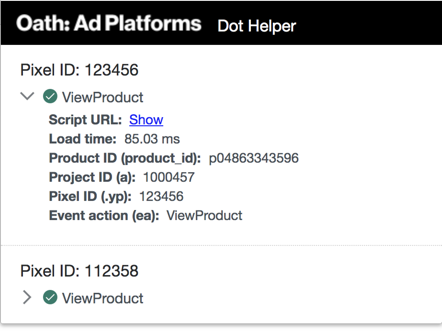 Once you’ve installed Dot tags as part of your Dot instrumentation, this handy tool lets you verify if those tags are sending all the necessary parameters required by Native Feed Ads. Event action (ea): Note that the acceptable values are ViewProduct, AddToCart and Purchase. If any of the required parameters are missing, the Dot Helper tool will display an error message data unavailable in red text for that parameter. URL: The full script URL, in case you wish to check and verify other parameters. Load time: The time it takes for the pixel to load. This is valuable for understanding the pixel performance. Some websites send additional parameters through Dot: for example, gv (for transaction value), et (event type), el (event label), and so on. Since they are optional, the Dot Helper tool only displays these parameters when they exist. No error message is displayed if these parameters are not present. duplicate Dot tags on one page. If your e-commerce website installs more than 1 pixel for different campaigns, this instrumentation is acceptable. However, if the same pixel ID is fired multiple times on a single page, errors may occur. Navigate to How to associate your Dot tag to a Product Catalog, which describes in detail how to associate your dot tag to your product catalog.